This is a quick entry, mostly for me. I've been using the very good Markdown editor, Markdown Monster, and wanted to automate creating blog posts. I have a manual process that I thought I could somewhat automate. 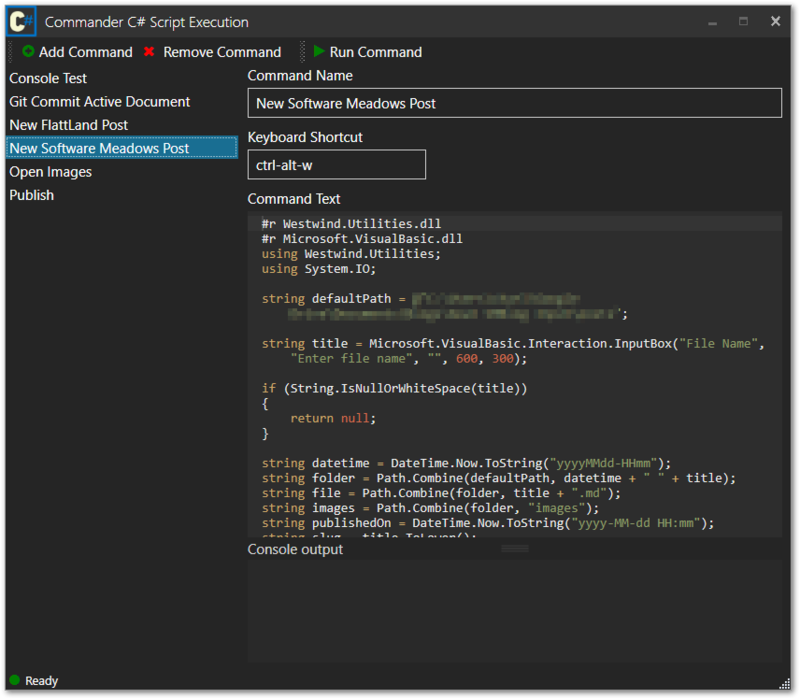 MM has an addin that lets me write C# scripting and control a lot of the editor. Prompt for a post title. Create the post file in a known folder. Open in a tab for editing. Open the post folder's "images" folder. Here's the code for creating the post, some of which is seen in the above screenshot. There were some things I couldn't accomplish, noted in the code comments, probably due to my ignorance of how the MM API is supposed to work. ////HACK: For some reason this allows the document to be edited. And, to publish, I do this. I have a batch file in my blog folder that takes care of the actual commit/push to Git.